Mumbai: Sahara India Financial Corp. Ltd, the country’s largest residuary non-banking finance company (RNBC), will sell its equity stake in Sahara One Media and Entertainment Ltd and use the proceeds to meet investment norms laid down by India’s banking regulator, the Reserve Bank of India, or RBI. RBI recently directed Sahara not to accept deposits that mature beyond 30 June 2011. An RNBC is required to invest all its deposits in government bonds, deposits of other commercial banks and corporate bonds with ratings of double A+ (AA+), indicating high safety. Sahara India is one of the promoters of Sahara One Media and currently holds 16.32% stake in the company. Sahara One Media, which is into the business of television and film production, has a market value of Rs450.30 crore, based on its share price of Rs209 at close of trading on the Bombay Stock Exchange on Monday. This means that Sahara India’s stake is worth Rs73.49 crore. Shares of the production house hit their lifetime high of Rs820 each on BSE on 10 January. At that price, its stake in the firm would have fetched Sahara India Rs288.33 crore. In a June communication to RBI, days before the regulator banned it from accepting fresh deposits (this ban was subsequently lifted and the RNBC was given a three-year sunset window), Sahara India agreed to sell its equity holding in Sahara One to “bridge the gap in directed investments" in accordance with the norms of the central bank. In that communication, a copy of which has been reviewed by Mint, Sahara India said it would bridge the gap “through internal accruals and/or by way of sale/mortgage/lien on its fixed assets". It assured the central bank that it would reduce the gap of Rs714.81 crore in directed investments to zero by December. “We are committed to make good the gap for the purpose of security for depositors by March 2009," the firm said. BSE was yet to announce this information on its site till Monday evening. Sarckar also said that there is no gap in Sahara India’s directed investment. “We would like to draw your attention to the fact sheet published by us wherein it was clearly stated that the value of directed investments held by the company fully covers its liability towards depositors." In the June communication, Sahara India also dropped its proposal of converting the RNBC into a commercial bank. According to the communication, on 19 January 2008, Sahara India had written a letter to RBI saying it could run the daily deposit schemes “as a bank" as and when permitted (by the regulator). In that letter, the company said “it was aware that it would take some time before it became eligible for a banking licence" and assured RBI that “it would do what is required" but in June, it decided not to pursue the proposal and, hence, did not submit the interim report of audit and consulting firm Ernst and Young which was advising Sahara India on its proposed conversion into a bank. Sarckar, however, denied submitting any proposal to RBI seeking conversion of the RNBC into a bank. He said: “SIFCL (Sahara India), so far, has not submitted any proposal to RBI for its conversion into a bank hence there is no question of RBI’s rejection in this regard." Sahara India recently doubled its authorized share capital to Rs1,200 crore from Rs600 crore. The firm had issued compulsorily fully convertible non-cumulative preference shares to its existing promoters in May, a month before RBI set a three-year sunset window on Sahara India, allowing it to accept fresh deposits maturing till June 2011 and asked it to reduce deposit liability to zero on or before 30 June 2015. RBI had on 4 June banned Sahara from accepting public deposits from any person in any form—by way of fresh deposits, or renewal of the deposits, or otherwise—with immediate effect. However, the Lucknow bench of the Allahabad high court stayed the order the next day. The banking regulator then moved the Supreme Court to lift the stay. 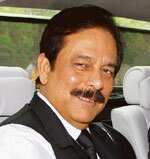 The apex court on 9 June had directed the regulator to hear Sahara India once again before arriving at a final decision. In papers filed with the Supreme Court, the central bank claimed Sahara India failed to invest $280 million (about Rs1,225 crore) of its $4.3 billion in deposits in mandated low-risk bonds. RBI also accused Sahara of slashing depositors’ interest payments whenever they fell behind on their instalments (many of the firm’s depositors invest money in instalments). After several meetings between the central bank and Sahara India executives, RBI, on 17 June, passed a fresh order allowing Sahara to accept fresh deposits maturing until 30 June 2011. The regulator had also asked the firm to reconstitute its board with 50% of the independent directors being nominated by RBI. On 15 July, Sahara India published a “fact sheet" in various newspapers, with financial details of the firm. In the fact sheet, the company claimed that it had invested all its deposits in financial instruments, including government bonds and fixed deposits of banks. On 20 July, Sahara India appointed chief executive of Indian Banks Association H.N. Sinor, former president of the Institute of Chartered Accountants of India T.N. Manoharan, and A.K.D. Jadhav, a former IAS officer from the Maharashtra cadre, as independent directors.